The London Marathon was on Sunday. For anyone who attempted to run the roughly 26 miles, it was a day to remember, not least because it was also the hottest London Marathon on record (75.3-degrees Fahrenheit isn't that hot, but let them have this one). The biggest day of all, however, was probably had by a man who ran the race dressed like a dinosaur. As you can see in the clip above, one Englishman seized the day by not only running the marathon, but also proposing to his girlfriend while dressed as a Tyrannosaurus rex. Obviously, she said yes. And it's our humble position that this man ought to be knighted immediately. A BBC reporter interviewed the couple, so the blissful moments just after the proposal were caught on tape, in all their Neo-Cretaceous glory. He asked them how long they've been together, and she responded, "eight and a half years." The dinosaur then added, “It’s been a while. Feels like 65 million years.” Coming from inside the costume, his voice was, to say the least, jarring. 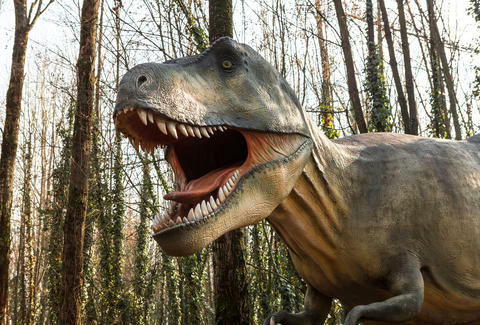 The reporter confessed, “It’s quite strange talking to you about this through the dinosaur suit," but asked what the runner loved so much about his fiance. The man dressed as an extinct creature famous for its enormous skull explained that his fiance had supported him throughout the years and, at a loss for words, simply reiterated, "I just love her so much." This might be the luckiest woman alive.